Place stake in desired location, slide unit over stake, t post, u post, mailbox post, etc. then lift and drop the driver on the post until it is in the ground at preferred depth. 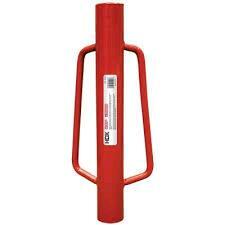 Once posts are secure attach fencing or mail box etc. * Please call us with any questions you may have about our fence post driver rentals in Petoskey, Northern Michigan & The Upper Peninsula.